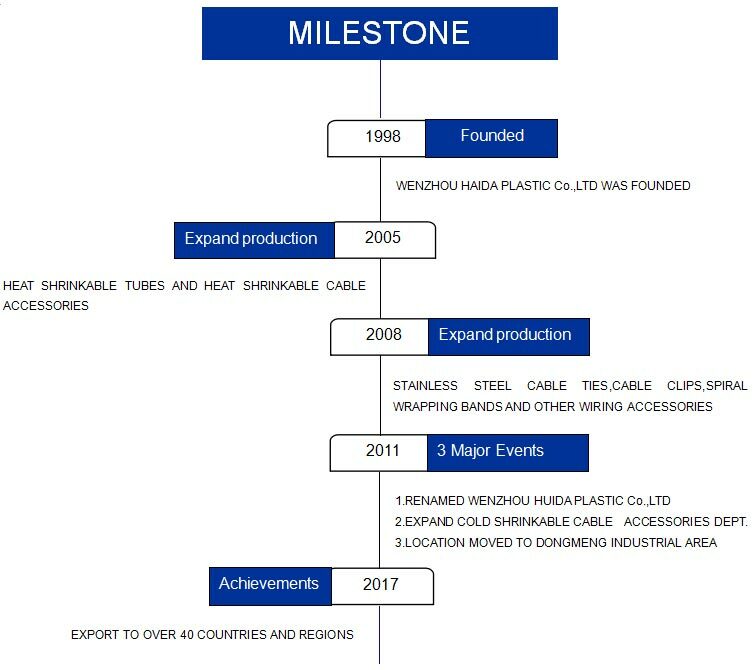 About us-Wenzhou Huida Plastic Co. Ltd. Established in 1998,Wenzhou Huida Plastic Co.,Ltd have grown up to be one of the largest manufacturers of wiring accessories in China. We have obtained ISO9001,UL certificates,CE certificates,ROHS report. Huida Company locates in Wuniu Town,Close to China Electrical Equipment Town LiuShi Town,with convenience traffic to Wenzhou Airport and Wenzhou express way. Our company has 14,000 m2 area,130 skilled workers staff,there are most advanced equipments with 27 plastic injection machines,17 pipe expanders.Now we developed The Hot Runner Molds,combining with Importing Materials which is from The USA and Central Automatic Material Provided System. Quality is assured! Our main products are Nylon cable tie,Heat shrinkable tube,Heat shrinkable termination,Cold shrinkable termination,Nylon cable gland and other wiring accessories. Our products have exported to over 40 countries with high reputation from customers.We have built up long term business relationship with some large enterprises both in civil market and abroad. Wenzhou Huida Plastic Co.,Ltd sincerely welcome friends and customers from everywhere worldwide to support us for better development and greater cause!